i really love Durin's family!!! Fill looks so intent. Brilliant idea and great drawing! This is adorable! I love Fili's braiding practice! sooooo cute. wait..... are the characters in the book really related? Yep. 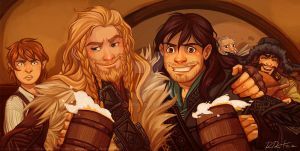 Fili and Kili are Thorin's sister's sons. huh. did not know that. thanks!! Nice! I really love these family pics. My dad shaved his beard when my sister was born he had learned with me that babies can pull facial hair out. O.o Are we related? Or did you ever meet my mother when she still lived and breathed? She used to tell me that she cut her hair short because I wouldn't stop chewing on it as a baby! Poor Thorin surley had a lot of trouble in bringing up Fili and Kili.